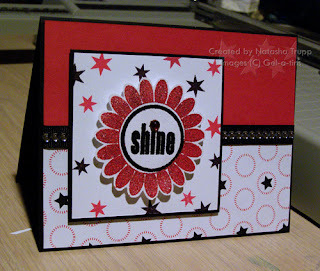 I knew I wanted to do something fun with this Junkitz paper and this gel-a-tins alphabet. So here is what happens when I get a little cutter-happy and when I feel like using waves in my designs. The sentiment is stamped in Stazon on a transparency. That transparency is attached UNDER the top flower layer, yet sits OVER top of the bottom green curvy part. I hope that makes sense! So I decided to finally sit down and actually put together the other 2 cards for my upcoming "going out in style" event. I figured I'd start with the Do the Hula one. It's very basic, which makes for a good warm-up card. I used Summer Sun, Green Galore, and Real Red for the colours. 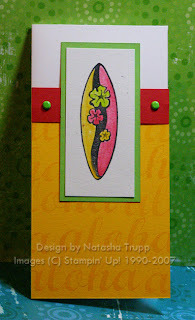 The surfboard was coloured in using pastels and a blender pen. 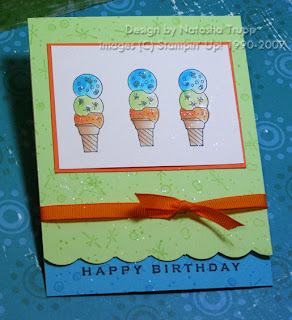 My 2nd card features Sparkling Summer. This was one of the first sets I added to my collection. It's also one of those sets I tend to forget I have, and then when I pull it out again I LOVE using it. I decided to base my project on the card that first made me really want this set. It's on page 232 of the 2004-2005 catalog. I changed a few aspects though. Instead of cutting out the ice cream cones (there are always complaints when I make my guests "work" by cutting things out, lol), they are just flat on the panel. I watercoloured them and then added some glitter. I also jazzed up the bottom by doing scallops. I used Tempting Turquoise, Gable Green, Only Orange, and a bit of Creamy Caramel. I figure I will do this card second. Already, I am sure someone will rotate the design. That's one of my favorite aspects, watching people change my design and truly make it their own. Since I got this set Holiday Cheer (by gel-a-tins), I knew I wanted to recreate a certain 2005 Christmas card I had made. I love using this trio of colours for Christmas cards. There's just something about it! 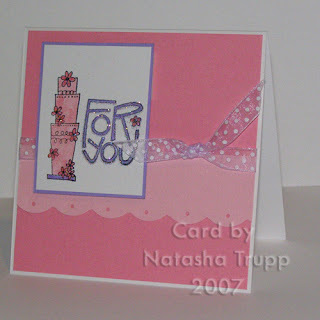 I used Stampin' Up classic inks for this one. The ornaments have tiny bits of stickles on them, and that whole panel is raised up on foam tape. I brought the crimper back out. I still like using it, even if it's not "in". Maybe it'll have a brief resurgence like the deco-scissors? The little snowflakes at the top are from the Mini Retro Flakes set. So, what do you make when you want to give a card to someone you really don't know all that well? Nature themes seem like a good idea. So that's what I did. 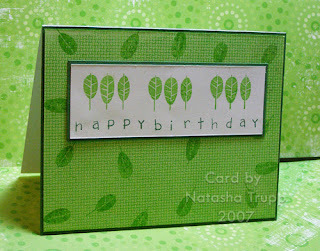 I pulled out All the Best, and just used the small trio of leaves stamp. 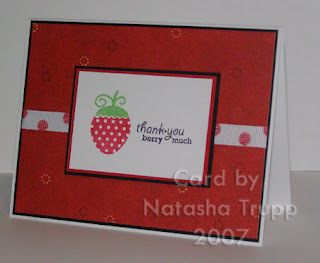 I used the medium casual snap stamps for the greeting, and jazzed up the background with Aida Cloth. Voila, 10 minute card! Woot! Sketch Challenge, it's been a while. I used to do the sketch challenges almost religiously every Tuesday night (right when they'd be posted), but I just don't have the time anymore to do that. So sometimes I don't even check the sketch challenge until late Wednesday (gasp!). Anyway, I particularly liked this week's sketch, so here's my take on it. I knew I wanted to use my gelatins set "Bloom". I had it all set to go, but it just seemed to bare. So I pulled out an older background, stamped over top of my bloom background. Then to jazz that up even more, I coloured in the little flowers with the white gel pen. This may seem cheesy, but half the reason I wanted to make a card tonight was because I got this nice new lamp from Costco. It's got a "sunlight bulb", so I figured no more running outside to take pictures (which is nice, since it's been particularly wet these past days). I am pleased with the results! So this picture has no editing. Usually I have to do a bit of noise reduction and the occasional cool filter in Elements. 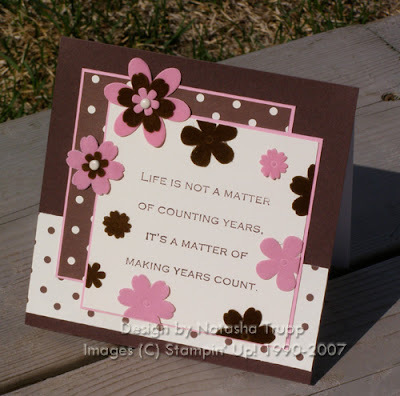 I decided I might actually get something together in terms of holding a "retirement party" for the stamp sets. I looked at my sad box full of retiring sets and saw Balmy Breezes. I got in January and have only used it once or twice! 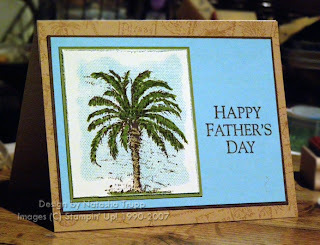 I thought, "Hey, that would work well for a Father's Day card". So that's where I began, I decided to throw in a little bit of my favorite soon to be out-colour. I coloured the palm tree with markers. I hate leaving a blank sky, but it's a real pain to colour it. So I looked over to my cd holder of background stamps, Linen practically jumped off. I inked up the background stamp in the middle, placed the coloured image onto it, and did the "finger-walking" method of pressure. I actually got surprisingly even coverage. Now I just need to come up with 2 more workshop-caliber cards. I'm thinking something with my all-time favorite Do the Hula, and also maybe something with Petal Prints and French Script. Those 3 sets retiring probably hurt the most. So since the the gelly gems come so nicely in a long strip, I could just separate them where I needed to and place them right on top of the ribbon. It's like the card was meant to have those gems on there, they fit exactly, on either side of the main image panel! How often does that happen! I was just checking out the gelatins website, and unfortunately these gems "dazzle me" are on backorder, but there's still some of the "bright lights" here if you're interested . I love the idea of packaging your own little treat bags together, but I've never bothered to do it. Until now! I had salvaged the small clear bags from the Studio G stamps, thinking they might come in useful in the future. First, I stamped some retro flakes (gelatins) in white stazon all over the packaging. 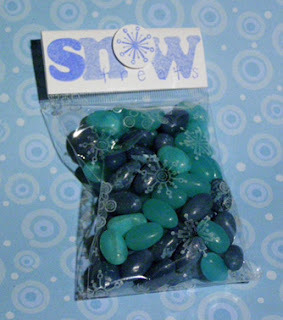 Then I filled the bag up with 2 different blue jelly beans. I had to make a topper too, so I measure the the top of the bag (there's a hanger space, but they were never hung at Michaels). The topper measures 2-1/8x 2-13/16, then it is folded in half. I stamped the letters s,n, and w from my Groovy alphabet (also gelatins), then punched out another retro flake (which was perfectly sized for my 3/4 circle punch) for the "o". The word "treats" is from my snap stamps. I thought about it afterwards and realized icy treats might've been a better name, but then I wouldn't have been able to use a snowflake as an o! I wish my photograph could do this justice, it really is quite adorable, and there's something kind of fun about being to hold something in your hand and crinkle it. While getting the store's Mother's Day cards returns ready,I found these awesome shimmery white envelopes. The company only takes the cards back, not the envelopes. I was curious how these would stamp and watercolour, so I took them home. Well, I am happy to say they worked quite nicely! I used Bothway Blossoms and had some fun watercolouring. 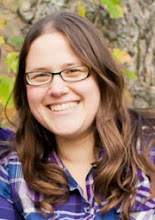 Here's a close-up of the shimmery-ness, since it's hard to see in a non-zoomed photo. The rest of the card is relatively simple. I didn't want to take away from the shimmery goodness. So I used some more of my Au Chocolat paper. I've gotten better at actually using my designer papers. I used to really struggle with it, as if I was saving them all for the perfect scrapbook page in the future. I've finally realized that there is so much selection out there anyway, that when I am ready to make that "perfect" page, I'll probably get something else for it anyway. I might as well use what I have on cards! It's really hard to train yourself this way, but I'm getting better at using my giant Kassett box-ful of 12x12 papers! Because I started this card with the central panel, it ended up being an odd size. The card is 6-3/8x4-3/8. Do you ever just have one of those days, you start out, and feel like "yes, today will be a productive day!". But then, by the time you get home, get dinner together, and actually sit for a moment, absolutely all motivation is lost. Last night, I had every intention of at least doing something. Seriously, I sat at my desk for 2 hours (while watching the season finales of Smallville, then Scrubs) and did almost nothing. I stamped the word "groovy" with my new Groovy Letters alphabet set. Then I cut it out, that's it. I hate days like that. And tonight I have yet to get started on anything. So I will look into my files, I think I still have a few items un-uploaded from the crop, 2 weeks ago. I finally got some of these fabulous snap stamps. Of course, the first time I use them, I didn't even snap the letters together. I just liked the size of the minis for this card. I had bought these Basic Grey rub-ons a while back, not realizing that they matched the Perhaps collection. So I decided to pair the rub-ons with the 6x6 version of the yellow butterfly paper (Daphne). Then the butterfly seemed so lonely there, so I thought, maybe a little word and dot trail. I did "dream" first, but still felt a bit too much empty space, so I added "imagine", and "believe", and pieces of another butterfly. Only pieces, since there had been an incident with the butterfly sticking to the wax paper backing (I thought the wax paper was supposed to prevent that?). The rest of the card seemed to come together. This is a weird colour combination for me, but I really like how it turned out! I've got some fun, exciting news, but I don't know if I can share it just yet. Soon, I'm sure! The technique challenge today was to make a "warm-up" card. These are for getting those creative juices started. I started with an older set, Oh So Sweet, and paired it with some newer sentiments and accessories. I recalled that I had both chocolate and cherry scented embossing powder now. 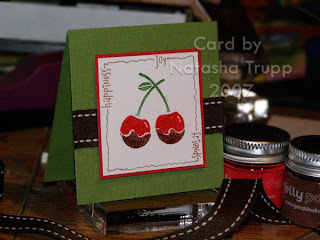 It only seemed appropriate to put them to use, together, with this delicious looking cherry. 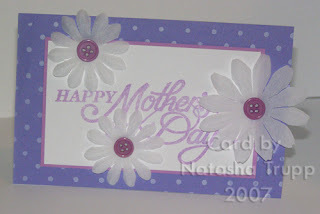 This card required the use of the stamp-a-ma-jig 3 times. I stamped the chocolate (being sure to clean off the unwanted ink parts with a wet q-tip), poured on the chocolate EP, heated it, then repeated for the red cherry part, then one last time to get the stems on. The words are from the gelatins set "chocolate bliss", the ribbon is from Dunwoody Booth, from a grab bag. I wish you could all smell how amazing this card smells! So I discovered that Beate is holding an AMAZING contest. She provided a sketch and some very tempting prizes. 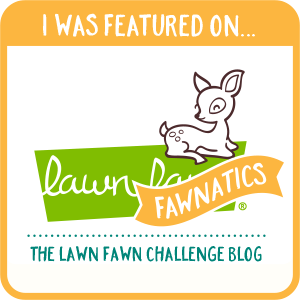 Check it out here: It's a BIG deal! if you're curious. Sketch challenges have always been my favorite type of challenge. I like only having that blueprint to work with. Here's my first card. After doing this one, I kept getting more and more ideas for other cards. I'm sure I'll do at least one more. 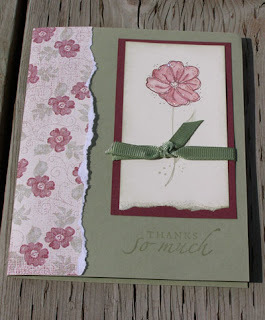 For my card, my inspiration began with these little velvet flowers (by Maya Road) and the cream brads. The au Chocolat paper seemed like an ideal match. I did something here that I rarely do. I made the focal image text. It just worked for this card. So the first thing I needed was a book, I found one at the dollar store. It holds 5x7 pages. 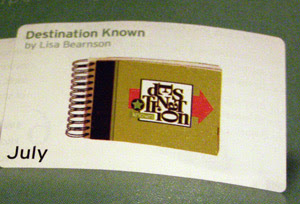 Next, I used my upper and lower typeset font for the mixed up "destination". 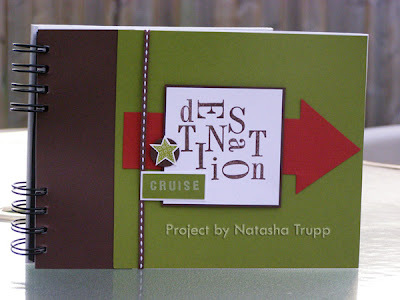 I used the rough edges mini alphabet for the word cruise. The star is from the gelatins Super Star set. The arrow was traced from one of those purple sparkly templates. 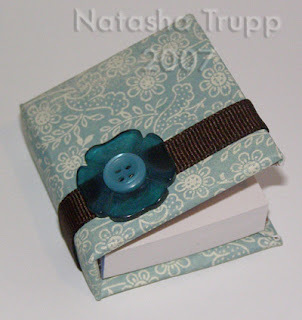 I don't know who makes them, they first came out when scrapbooking was just starting to be more mainstream. And that was that! I was very impressed that I managed to achieve a similar look with my book! Here's a quick little thank you note. I started with the central image, and since I was at the crop, I could search for perfect background paper. I forget how made this one, starts with imagin... I made the ribbon to coordinate. 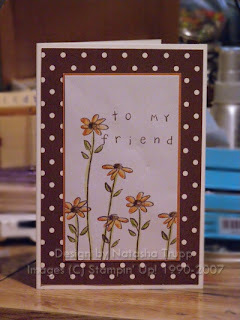 I used craft ink and one of the fun dots from the Paper Tray set. Now about the clear cards, someone mentioned a tutorial, but it may have been a joke in passing? Is that actually something anybody wants to see? 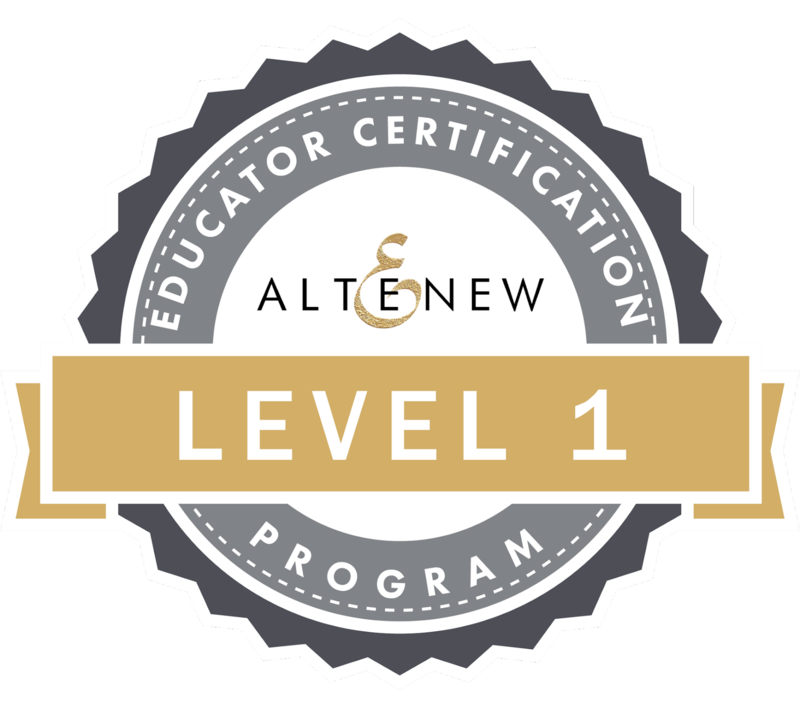 I like making tutorials, but it's kind of a case of "it's all been done", especially with more and more stamping blogs popping up all the time. Also, I don't have a good intuition when it comes to knowing what may be totally obvious to me, but a complete mystery to others. So if there's anything you ever want to know, please let me know!!! Fun, yet classy black and white circles. Here's yet another creation from Saturday. I love making clear cards. I think they are my favorite! I stamped some circles in white stazon on the acetate. The black frame is actually the interior panel. I forget who makes the black and white spotted paper. The main part, with the message(by Green Grass stamps), also has more circles from the same set (you spin me round) stamped to jazz up the corners.. 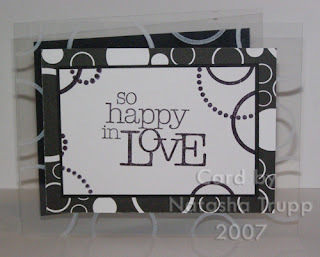 Here's a card featuring some of the Michael's clear stamps. 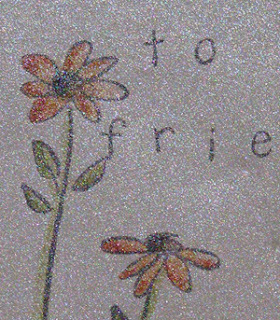 I stamped the "for you" once, coloured it in, then stamped into the glue pad and line it up and sprinkled glitter on it. I love this look with coloured in images! The cake only has glitter in the form of stickles on the flowers. This one is for one my grandmothers. 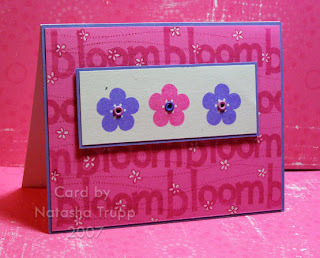 From this view, the biggest flower is covering the "s", but when looking at the card you can see it no problem. The stamp is by Stamp Barn. The flowers were part of the "welcome pack" for attending the crop, and the buttons are from a lady there. She saw me using buttons on Friday, so she said she'd bring a big bag of them for me, since she never uses them. These 3 buttons matched the orchid opulence ink quite nicely. 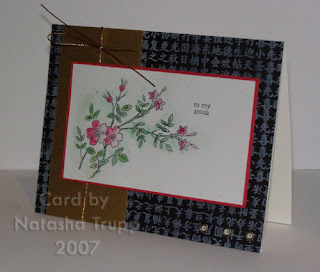 This card also features some stamps from the store's stash. I forget who makes this stamp, either Penny Black or Hero Arts. It was called Bloom, I think... 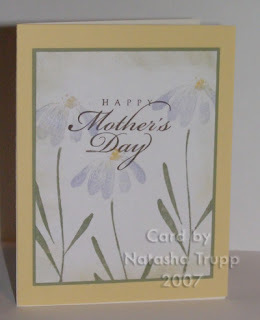 Anyway, this card is for the other Grandma. I haven't yet decided which is going to whom. All this week I should have plenty of updates from all the items I made these past few days, which is good, since I still have to unpack all my stuff! In fun mail news, I received this awesome RAK from Tara. It's beautiful! Love the papers and colours she used. There's a touch of glitter on the flower, it really sparkles. Thank you! A few creations and more good news! Two days ago I received notice that a project was accepted into the Papercrafts Holiday Special!! Then today, I received a notice from Cards, they have also picked up a project! And here I was thinking they'd never even received my submission! Here are some quick cards I threw together these past 2 days. I finally picked up some decorative flowers for my cards. I had been eyeing these daisies for a while now. Finally I picked them up. 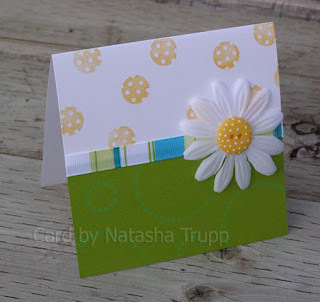 I had been really wanting to pair one of my polka dot buttons with a daisy, so that's exactly what I did! 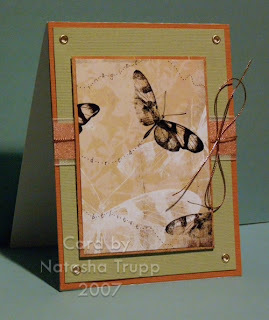 As I learned on this card, it's better to use dye inks for the tone on tone stamping look. After the green galore ink had dried for a day it got this weird look. Serves me right for being too lazy to go downstairs and get the green galore dye ink pad! My other creation is another bright and fun creation. My local Michaels FINALLY had the studio g clear stamps, so I picked them up. I really like the look of colouring the line art letters all different colours and then glitterfying it. 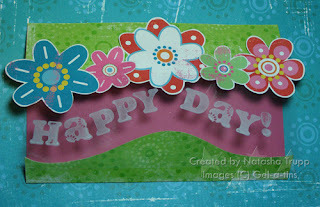 I got that idea from Emily's ATC that I received as part of a special swap. The "you spin me round" set by gelatins worked nicely to outline the punched out image. And it just so happened to match this awesome Doodlebug paper I had picked up last weekend. I decided that the best layout to showcase the small round sentiment was one of my favorite layouts. It just works when other stuff won't! 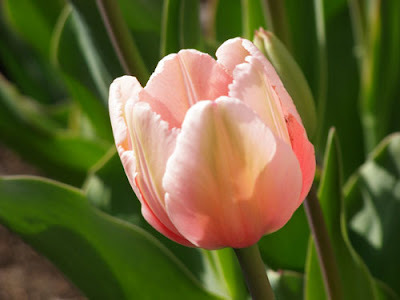 And in non-stamping news, the tulips are ALMOST ready to open. There are about 3 or 4 that should open tomorrow as long as it's a sunny day, which it's supposed to be. I hope to take some good pictures once I'm home from work tomorrow!